The documentary 'Invisible Women' walks away with the prestigious Emmy Award in 2013. 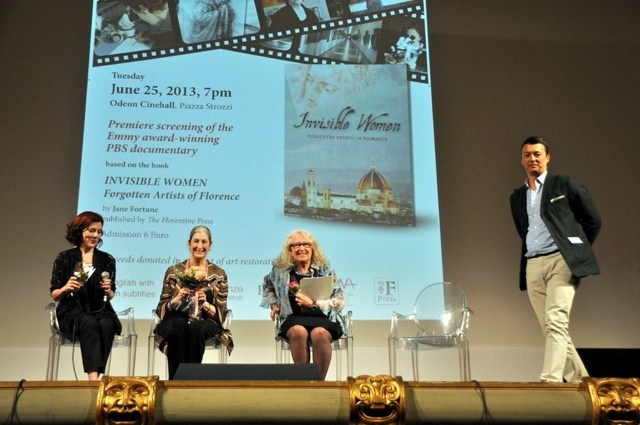 AWA wins a coveted Emmy Award for its documentary ”Invisible Women: Forgotten Artists of Florence”. When the Indiana-based production company WFYI approached our founder about making a PBS television special about her book, Invisible Women, Jane Fortune was, she says, ”over the moon”. The program features several women artists who had already become part of the AWA family via restoration—Plautilla Nelli, Artemisia Gentileschi, Irene Parenti Duclos. It also includes other hopefuls like seventeenth-century court artist Giovanna Fratellini and her stellar pupil Violante Siries Cerroti. It was the first time these two ”home-grown Florentines” had ever made the small screen. Invisible Women won the Emmy in 2013, voted the best documentary in the Art and Culture category. We celebrated our joy at Florence’s Odeon theater, at the film’s European premiere.